Exciting News! Who Wants Broccoli? has received some awesome awards! Bank Street’s Top 5 Animal Books List! Top Picture Book Award for Preschoolers by Keystone Reading Association for 2017-2018! SCBWI Atlantic Crystal Kite top 6 Picture Book! WHO WANTS BROCCOLI? is not a book about veggies! It’s a picturebook about a big, fun dog who wants a forever home more than anything in the world. Broccoli thinks his tricks will help him get picked, but it only gets him a timeout from Mr. Beezley! Will Broccoli ever get picked as someone’s perfect pet? 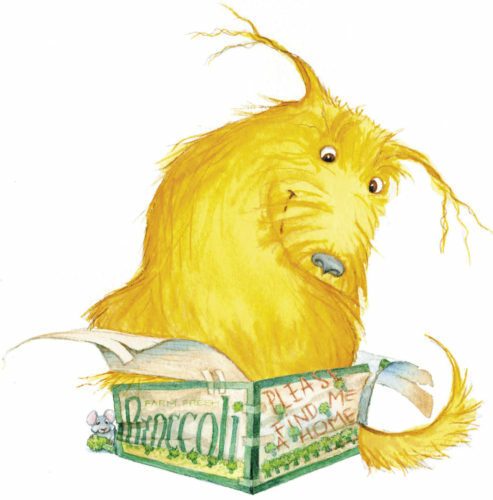 Broccoli’s tale is all about ‘always staying true to who you are’ for the happiest of endings!! Please tour my website to find out more about Who Wants Broccoli? © Val Jones. All rights reserved. Website by We Love Children's Books.